One of the most wonderful sites I’ve ever found that is dedicated to readers is Goodreads.com. The members of Goodreads are passionate about books and communicating with one another their preferences. You only have to read the reviews of a new book to realize how committed the members are to their shared passion—all things books! The site allows inter-communications via email, members to follow others’ recommendations, and be-friend one another. Members have personal pages, and authors can build their own pages, linking their books, posting on an internal blog, and adding a review widget to their web site to name a few items. I was able to start a dialog with many of the reviewers who showed an interest in character-driven, space-opera stories. This led to a priming-of-the-pump, so to speak, of my own novel before it was published on Amazon and has set the model for my future efforts. To the members of Goodreads, I doff my hat. They are a superb bunch of people who care for the written word and the stories of authors. This entry was posted in Readers, Uncategorized on February 22, 2015 by Scott Jucha. Alisha Of Damon Za has done it again! Last year, I found the Damon Za web site that featured book covers at very reasonable prices. You only have to see their home page banner to see the quality of their work. I was paired with Alisha, who created the cover for The Silver Ships. We did go back and forth for almost a month on that first cover. I created a rough design of the silver ship for her, which she transformed into the present image. And, here’s the good part. I went back to Damon Za for the second cover (Libre, A Silver Ships Novel ) and requested Alisha for the work. 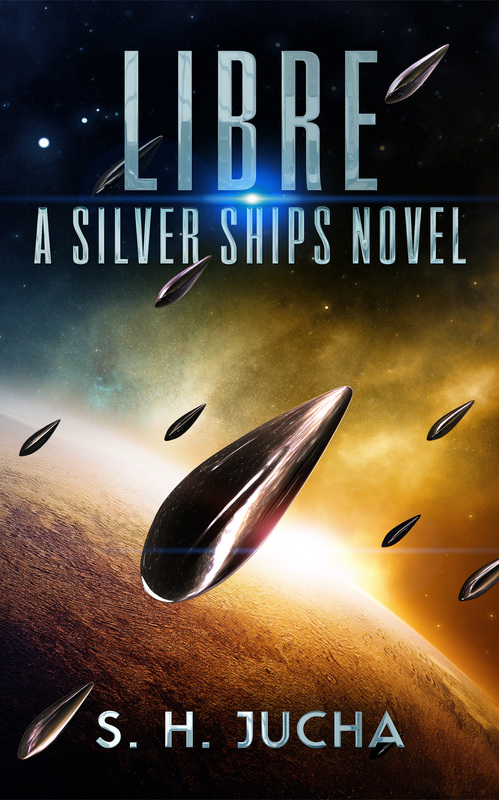 After completing my order, I emailed Alisha my ideas for the cover based on a test cover she created for The Silver Ships. She nailed it the first time. Her cover was exactly what I had in mind. Okay, so maybe my mental image was a little fuzzier than hers and maybe not as eye-catching, but you get the idea. Great job, Alisha! This entry was posted in Cover Art, Uncategorized on February 13, 2015 by Scott Jucha. “The Silver Ships” is Published! 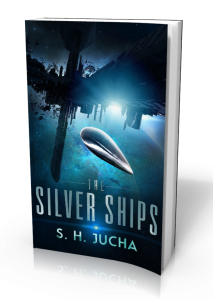 The Silver Ships was published on Amazon on February 7th and is available in both Kindle and softcover versions. If you have Amazon Prime, the Kindle version is available for free download! It took fifteen months from the time I sat down with my 100+ scraps of paper—character descriptions, technology and world concepts, chapter ideas, and smatterings of dialog—to write the story and work the review processes with my editor, Angela Polidoro. At the heart of the story, I wanted to express my view that the individual counts, that an individual can make a difference. It’s a concept applied in my science-fiction stories, and it’s applied by people in the real world today! This entry was posted in Readers, Uncategorized on February 13, 2015 by Scott Jucha.